We have a new look here at F13! And new services. And a newly energized sense of mission. If you’re new here, there’s never been a better time to get to know what we’re all about. We believe an art brand takes shape when you create a business centered on thoughtful commercialization of your artwork. When your efforts are framed by intuitive marketing that reflects your passions, values, and lifestyle, you inspire authentic engagement with your audience. When all these pieces come together, the result is a dynamic art and lifestyle brand with a devoted customer base that extends your marketing virally and exponentially expands the value of your brand. When I wrote that—about four years ago, as F13 was just getting rolling—it was one of those moments when the words fell perfectly into place, where the vibe of an idea that I’d had for quite a while was suddenly ready to be articulated. It spilled onto the page and it was just done. Fully baked. It’s a statement that still resonates beautifully for me and perfectly defines my ideal client. Precisely how I wanted to serve that client has required more experimentation. Fortunately, I’ve been able to work with some incredible entrepreneurs who’ve stayed open, curious, willing, patient and generous, as I’ve worked out the finer points of my business model and service offerings. They’ve allowed me to test theories and procedures, they’ve shared with me their hearts’ desires and the inner workings of their businesses. The variety of art business owners—the range of personalities, visions, strengths and weaknesses, art styles and revenue models—that I’ve been privileged to get to know along the way is rich and diverse. Each client represents a unique set of challenges and opportunities. I relish the way I get to dive in and work deeply with each of them on a very individualized and confidential level. Over the past several weeks, as I’ve worked to completely re-envision the F13 website, I’ve been thrilled to be able to see, so clearly, what we’ve created. And by “we” I don’t mean simply me, Chuck, and Henry; I mean you, too. 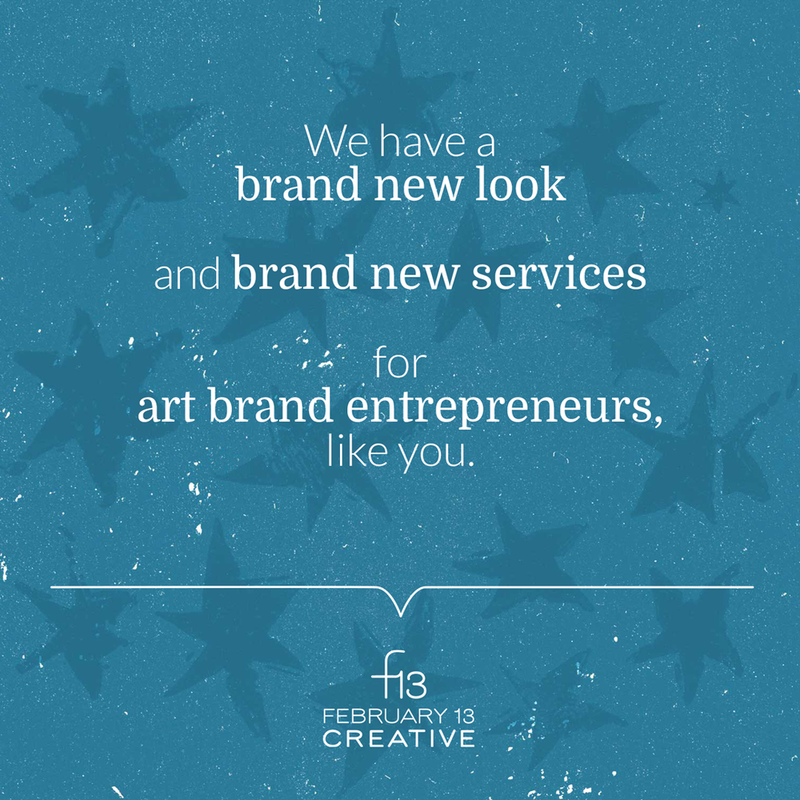 Those of you who’ve worked with us (and even those of you who’ve just been following on social media) have been instrumental in the creation of F13, because it’s your dreams and desires, and your individualized, independent businesses that motivate us. You are our inspiration, and this business is dedicated to you! If we haven’t worked together yet… or if it’s been a spell since we last spoke… I would love to hear from you. My Art Brand Strategy Session continues to be a game-changer for so many artists and I’d be truly delighted to do a session with you!